For retirees Kym and Jenny Dixon now is about enjoying the good life. The couple had holidayed in Kym's mother's transportable home for the past 20 or so years before deciding to upgrade. "Originally mum had bought a transportable home that we would often come up and holiday in," Kym says. "But it was getting quite run down. It needed new roofing, guttering and a bunch of other things. In the end we decided there wouldn't be a whole lot of difference in the cost between renovating or building a new home. "We asked around and found that Sarah Homes had a great name for these types of homes and after looking at display homes and on the internet we found the design we really liked." The couple modified the two-storey Lawson to include a kitchenette on the ground floor by deleting one of the bedrooms. "When we come up here it is often with friends or our adult children," Kym says. "By having the second kitchen on the ground floor it creates two independent living areas so visitors can potter around and get their own breakfast in the morning if they want." The ground level also includes a large walk-in storage area next to bedroom three and a second understair storage area, ideal for keeping bicycles and storing wine. The second minor bedroom is placed on the other side of the central family living area. A laundry with linen cupboard and outside access is adjacent to the main bathroom. There is a large decked area to the rear of the home. Upstairs houses the main suite with built-in wardrobe and ensuite with a powder room for guests adjacent. The large open-plan living and meals areas enjoy sea views via walls of glass. The kitchen has a large walk-in pantry bench with breakfast bar, overhead cupboards and stainless steel oven and rangehood. "When we chose our design the open-plan living aspect on the top level with a view was the primary focus," Kym says. 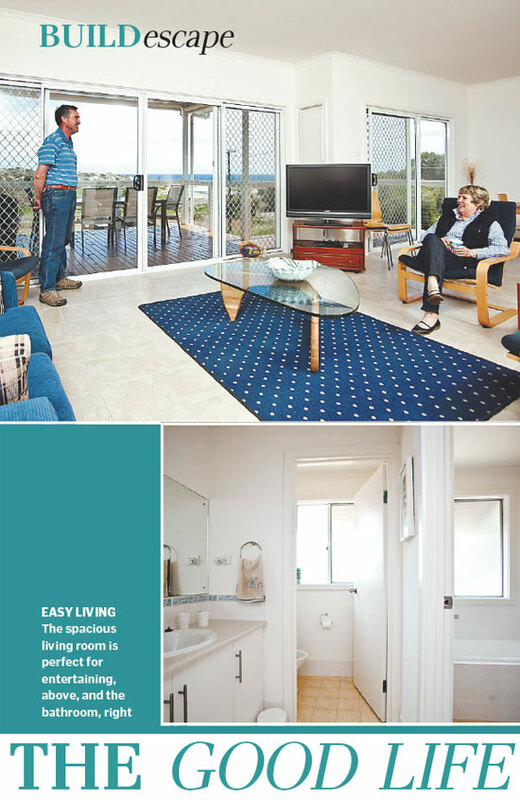 "It allows us to entertain groups of friends in plenty of space and comfort. "The large decking is also fantastic and we would spend the majority of our time sitting out there, enjoying the views." Drop-down awnings provide guests wind protection while they enjoy the alfresco lifestyle. "Tiles run throughout the home because they are so easy to keep clean, especially when you are coming and going from the beach," Kym says. "We wanted to create a low-maintenance home and one day we may move down here permanently."